Rhodesia in the context of history – by one who lived there. In general terms the concept of Rhodesia’s government has always been to retain control of the country in civilised hands which is not the same as saying that it should be exclusively in white hands. In the early years after 1890 this was not really an issue and so was not consciously expressed as it was later especially after about 1950. It must be remembered that the whites really did settle in a country which was all but empty – probably no more than about 500 000 people in a country 3 times the size of England. To get that in perspective: the city of Oxford has a population of about 160 000 people. In 1890 the native population of what became Rhodesia was only about 3 times this. But as Rhodesia is three times the size of England a fair impression may be gained by imagining the people of Oxford as the only people living in the whole of England but living in small scattered communities with large areas uninhabited. This was the situation the whites found in Rhodesia. Next it really must be understood that, even by the standards of the day, these few natives who were living in Rhodesia were indeed living in a state of complete barbarism. In today’s modern and politically correct world this is often forgotten or conveniently overlooked! But it has to be said. It is necessary to transport one’s self back to the late 19th century to understand the context of the times. Today’s standards of morality cannot, and should not, be applied to a quite different time and environment. And nor should those living now be so arrogant as to assume that today’s morality, in all its various facets, is necessarily better, or worse, than that of another age. One has only to imagine how today’s apparently accepted truths may be viewed in another hundred years time. So the world in the late Victorian era was a time of international competition and rivalry, just as today. In those days Western nations were clearly highly civilised or advanced compared with those in what is now called the third world. They certainly felt they were and it was a widely and sincerely held belief that the advanced nations had a moral duty to uplift those less fortunate by giving them the benefit of modern civilisation. Typical of the time, this was given voice by Kipling in his famous poem “The White Man’s Burden”. It was felt that the natives could only benefit from the sound government and administration which came with the trading of raw materials and agricultural produce for the manufactured goods of the home country. Thus having a big empire and obtaining colonies was the way almost everybody and every nation thought – just as 100 years later the leading powers competed in the nuclear missile and space race. Those who today rush to pass judgement on the people of another age and place may not be as morally advanced as they care to think! And, just for the record, since they often view themselves as anti-colonialist, the United States was also playing the same game. In addition to having occupied land similarly sparsely inhabited by native tribes, the USA had only recently acquired Alaska; whilst the far from empty Cuba, Hawaii and the Philippines were annexed after the British had settled Rhodesia. Various European states were seeking control of what were considered, by them, to be “unclaimed” territories. A number of international agreements in the early 1880s allocated the Congo basin in central Africa personally to King Leopold of Belgium and confirmed the long established Portuguese colonies of Angola and Moçambique. Germany established itself in South West Africa (now Namibia) and East Africa (now Tanzania). The South African coast had long been British. Two Afrikaner (Boer) republics, which were themselves looking to expand, almost blocked any route to the North for the British. The son of an English clergyman, and later self made diamond tycoon, Cecil Rhodes was elected Prime Minister of the Cape Colony and sought to obtain the hinterland of Southern Africa for Britain to forestall any other power. Both Portugal and Germany would have liked to gain control of what became Rhodesia so that they could establish a saddle of territory right across Africa. Rhodes sought to claim the area between the Limpopo and Zambezi Rivers, and beyond as far as the Belgian Congo, for Britain. He was widely believed to have saved Central Southern Africa for Britain and this was undoubtedly true as had he not occupied this area another, probably less enlightened nation, certainly would have done so. See here for an example, and not the only one, of what happened where Rhodes did not succeed. The almost empty land which became Southern Rhodesia was considered ideal for settlement from overcrowded Britain. To establish the new colony, Rhodes used the vehicle of a trading company: The British South Africa Company, which was granted a Royal Charter by Queen Victoria in 1889. A pioneer column of the first settlers travelled by what Americans would call a “wagon train” and reached an area of empty land which they named Salisbury on 12th September 1890. As with the American settlement of the West, there were a number of skirmishes with native tribes and, amazingly, Rhodesia even had a nationally significant incident equivalent to “Custer’s Last Stand” that being “Wilson’s Last Stand” when the Shangani Patrol was annihilated in 1893 whilst seeking to capture the Matabele king, Lobengula. 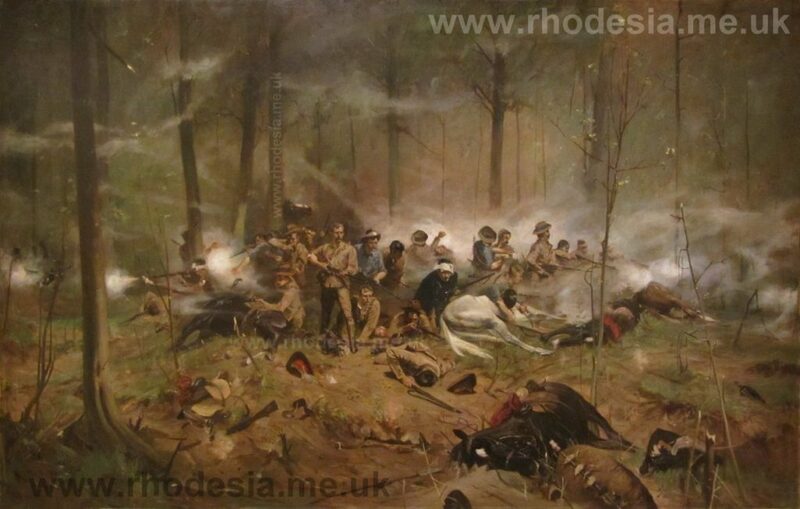 The Last Stand of Major Wilson at Shangani, December 3rd 1893 – by Allan Stewart. It should not be forgotten that the whites who occupied Rhodesia were but the most recent to do so. The Ndebele, or Matabele, (an offshoot of the Zulus) had become overlords of the same territory by conquest as recently as the early part of the 19th century whilst their vassals, the much more numerous Mashona tribes had some centuries earlier similarly completely ousted the San / Bushmen. It is the Bushmen who may arguably be considered the true indigenous inhabitants of the area and their rock paintings can still be found all over the country. The Mashona tribes and then the Matabele were in fact conquerors and “settlers” of the land in turn just as the whites were after them. As early as 1898, by an Order in Council passed in London, a system of representation was set up and this granted the franchise on an equal basis regardless of race. In passing, it should also be mentioned that in setting up the world famous Rhodes Scholarships to Oxford University, and at a time when it was almost unheard of, Rhodes’s Will is remarkable in specifically providing that: “No student shall be qualified or disqualified for election to a Scholarship on account of his race or religious opinions.” His dictum of “Equal rights for all civilised men” became a guiding principle in the future government of Rhodesia. Until Britain granted self-government to Rhodesia in 1923, the country was administered by the BSAC which had a majority on the ruling Council although as time passed there was an increasing minority of members directly elected on the common voters roll. Because of the vastly superior skill and wealth of the whites, a system of reserves (similar to those in the USA and Canada) was set up to safeguard the native Africans which prevented whites from acquiring the land set aside. Before self-government these were allocated by decree of the British government and in 1914 the British Liberal government, under Herbert Asquith, set up a commission which recommended that the total land to be reserved for the blacks be set at about 25%. These reserves were then confirmed by the new British government under David Lloyd George and were intended to be the final allocation. Never-the-less, and contrary to popular belief, after Rhodesia was granted self-government, excluding national parks etc which were open to all, the amount of land reserved for the blacks was actually increased progressively from about 25% until by 1970 it had reached about 50%. In practice of course large numbers of Africans also lived on European owned farming land and in the towns and cities established by the white community. It is worth mentioning that under the 1923 constitution certain powers, largely as an extra safeguard for the African population, were reserved to the British government. In the 42 years from 1923 until Independence in 1965 there was not a single occasion when a British government of any party felt it necessary to veto legislation passed by the Rhodesian parliament. From 1923 until 1961 the Rhodesian constitution provided for an entirely equal and non-racial franchise. Rhodesia became part of the ill-fated Federation of Rhodesia & Nyasaland from 1953-1963. In 1961 a new constitution was granted by Britain, which removed almost all of Britain’s reserve powers, and was intended as the basis for Rhodesia becoming an independent Dominion, similar to Australia, as soon as the Federation was ended. The new provisions retained the non racial voting system but for the first time specially arranged to increase the number of African voters by setting up a second “B roll” with lower requirements to qualify. After Britain wound up the Federation of Rhodesia and Nyasaland in 1963, both Northern Rhodesia and Nyasaland which had been self governing for just a few months were granted full independence, as Zambia and Malawi, but Southern Rhodesia with a proud history of sound self government for more than 40 years was not. This was because Britain now wanted to impose a black majority rule government whilst Rhodesia wished to retain government in responsible hands. Rhodesia had already seen the results of granting one man one vote independence constitutions which often led to widespread intimidation of barely literate or illiterate voters. The result was “one man one vote once” and then a dictatorship by an incompetent despot. All Rhodesians had to live together with each other in Africa which was not the case with those, many thousands of miles away, who sought to impose idealistic solutions from outside. As a result Rhodesia felt compelled to follow the example of the United States and many former colonies in South America and declared itself independent on 11th November 1965. The Independence Constitution was almost identical to that granted by Britain in 1961 but removed the few remaining British reservations. 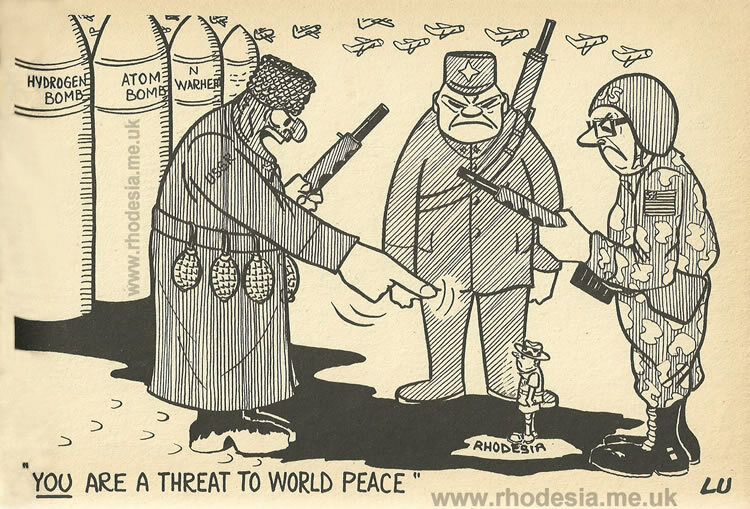 A cartoon by E Lucock illustrating the distorted world morality applied to Rhodesia. Most of the world turned on Rhodesia in a self-gratifying moral outrage and imposed trade sanctions which were fairly well circumvented. However in 1975, after a left wing coup in Portugal the previous year, Rhodesia’s long border with Moçambique became directly exposed to terrorist incursions and after a valiant struggle in which the terrorists were aided and abetted by the communist states and those in the West who should have behaved better, to put it mildly, Rhodesia was forced to succumb. As is almost invariably the case after a conflict, it is the winners who get to tell their story and speak. Most of the history about Rhodesia is now taught from the viewpoint of the winners: the butchers of ZANU; Robert Mugabe and his henchmen. Enough said!